Welcome! The object of the Group is to promote narrow gauge railway modelling at approximately 16mm = 1ft (equivalent to 1/19 full size) running on 0 gauge (32mm) track giving a prototype 2ft gauge or 1 gauge (45mm) track to represent 3ft gauge prototypes. This scale of modelling is big enough to enable live steam locomotives to run on track in your own garden. We meet regularly at Merstham Village Hall, Station Road North, Merstham, Surrey RH1 3ED (off Junction 8 of the M25) or by train to Merstham station - and a 3 minute walk. When? The first, third and fifth (when applicable) Friday of every month from 7 to 10pm. See the 'Contact/ Find us' tab for map. At our meetings we run trains on one of our layouts. 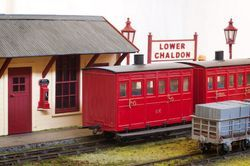 Members run live steam (coal, gas or meths fuelled) as well as battery powered models of internal combustion locomotives. Advice is freely available to guests as well as members. If you would like to come along to some of our meetings please use our our information line on 020 7043 5514 to check that we are running. 16mm members are also very flexible in their approach and few count rivets or spend weeks deciding on the correct shade of black for their latest creation (although we do have some such devotees - read about their current projects in our Oily Rag newsletter.) We aim to enjoy our modelling regardless of our abilities or following in a convivial atmosphere. As a group, we run two increasingly popular All Day Steamings for 16mm Association members in March and October; often the first Saturday of either month but check before travelling. These attract a number of traders, a second hand stall and a variety of layouts that you may come and run on. We look forward to seeing you there! Saturday 5th October from 10am - 4pm. Open to 16mm NGM Association, G Scale Society, 7mm NG Association and invited guests only. Sales day can be manic and we cannot guarantee to have the time to help you on the morning of the ADS; please help us and get to the show as early as possible to book your items in. Booking in for our secondhand stand starts when the doors open (or beforehand for ESG members) and sales start at 11:00. "Bring something to run - sell your excess railway paraphernalia - buy something from our traders". Download your secondhand sales form here Print BOTH SIDES and bring it along on the day with your items!